#RBTL and #CBTL are probably two of the coolest yarn-related hashtags you need to know for the second half of 2017, and if you haven’t heard of them yet, let me bring you up to speed. You’re going to need to know all about them over the coming couple of months (at least)! Back at the start of this year my bestie Tammy started talking about creating a shawl using the illusion knitting technique and was planning on using 2 balls of Scheepjes Whirl. I thought (and said) she was nuts. What sort of crazy person would want to knit – KNIT – a shawl using two kilometres of yarn?! Then the progress shots started appearing. At first I was all, god no. That’s two kilometres of yarn on 2.5-3mm needles. I just couldn’t process the level of effort involved in knitting such a huge project. As the shawl started to grow I began to think, oh, maybe I could knit that. The contrasting colours of the two whirls was beautiful (and it helped that it was the two rainbow colours) and the illusion technique is just so interesting. By the time the shawl was finished, and Read Between the Lines (RBTL) was born, I was blown away. The look that illusion knitting gives me so much pleasure. It’s hard to describe the feeling properly, but it makes me feel a bit fuzzy around the edges when I look at the way the colours sort of slide. It’s soothing, soft. I get the same feeling when I play with that magic sand stuff. The way the sand moves gives the same effect as looking at the knit. Does that make sense? The shawl first appeared in The Knitter magazine, and it’s been hugely popular. So much so that it’s pulling crocheters over to the dark side, learning to knit just so they can make their own RBTL, but a lot (and I mean a LOT) of people started asking for a crochet version. So it was time for the RBTL to gain a sibling! This week the Crochet Between the Lines was launched and the response has been so overwhelming that it basically overloaded Tammy’s website! Or combining both mine and Tammy’s Our Tribe yarns! I think using our two yarns would be a great idea, don’t you? Now, some details on how to get your hands on everything you need. 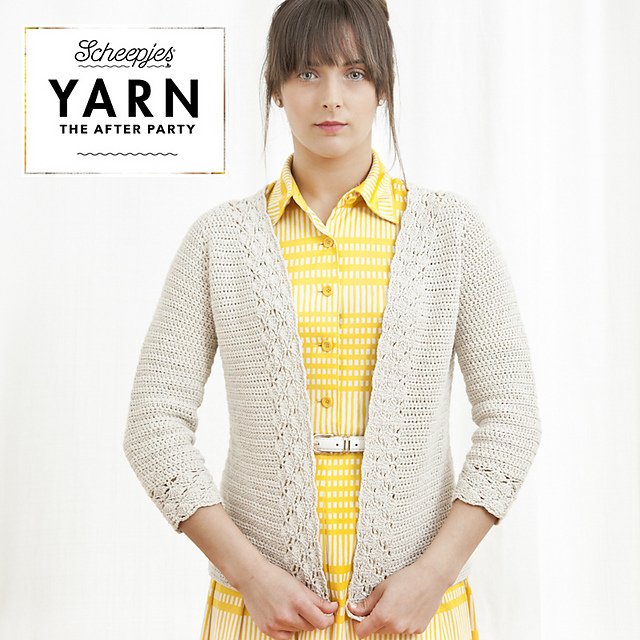 The After Party booklets containing the patterns are available at Scheepjes retailers throughout the Netherlands (in both English and Dutch), plus Wool Warehouse for global shipping. And what about the yarns? If you’re not one of the thousands of people with 15 balls of Whirl in your stash already to choose from, head to Wool Warehouse* globally, Black Sheep Wools in the UK, or to one of the many Scheepjes retailers in the Benelux. All those retailers stock Our Tribe too, so pick up a couple of those while you’re ordering! Tammy is hosting a MAL (make along) in the Scheepjes CAL groups, and I totally recommend joining in! The English group is here, while the Dutch language group is here. There are already loads of people sharing their colourways and their progress, it’s going to be a fabulous team project! Right, I’m off to swatch. I won’t see you again before Christmas, so I wish you all the very best, and catch you in 2018! If you follow me on Instagram, you’ll see that I’m busy plugging away on my Aquarel blanket (progress report on that this week), but today I’m taking some time out to investigate a new project. A new fortnightly pattern booklet from Scheepjes has just landed on my doorstep. It’s called Yarn: The After Party, and complements the twice yearly bookazine – Yarn* – that was launched earlier this year. The concept behind The After Party is to keep the creative juices flowing between Yarn editions, and each booklet will include a single pattern and a colour chart with all the available yarns. The styling is amazing, it makes me excited for the next instalment! The booklet is in English and Dutch (which is great for me to practice my Dutch pattern reading), and for all us Ravelry nerds, it’s also available as a digital download for a euro. If you buy the yarn for the design from one of the retailers, the booklet is free. The Linen and Lace Cardigan in this edition was designed by Annelies Baes. Annelies is such a talented garment designer, she is fully dedicated to figuring out how to create the best fit! I’m sure it’ll be an enjoyable project, the linen soft is so easy to work with, it was such a pleasure while I was making my Rustic Lace Blanket over the winter. Right, so the important info: You can get The After Party at your favourite Benelux Scheepjes stockist, and Deramores* will ship them worldwide. Still don’t have a copy of Yarn? Get it here*.